Check out this video. John Kiefer has finally released his NEW Carb Backloading Diet Book. In it he shows you how to use carbs like drugs. He shows you how to eat all the delicious carbs that you like, and get in the best shape of your life. What more could you ask for? 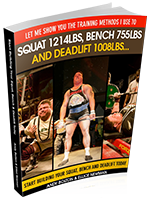 Not only does he show you how to do it, if you are a fitness nerd like me, he explains WHY and HOW it works. The amount of research that he put into this book is amazing, and Kiefer delivers it in his traditional no-nonsense style. This diet truly is a breakthrough. I hope you enjoy this video review.